Hybrid Bicycles Where else would you go to discuss these fun, versatile bikes? Getting a clanking sound on my relatively new Giant Escape 3. I've put 1,000 miles on it over the last 4-5 months but it's been well taken care of. Any ideas what is causing this? (sorry for the hairy leg shot). Last edited by mrl72; 09-12-15 at 05:11 PM. I had something very similar with my Trek 8.3 DS ... it was the pedal coming loose. My Roam 2 is starting to develop a ticking noise on the down-stroke of the right pedal. I'm thinking it's somewhere involving the chain, but not so sure. I can't detect it when off the bike and turning the pedals by hand while listening. Only on a quiet trail while riding. It is getting somewhat louder though. I'll have to try pulling that apart tomorrow. I did check the bolts and they were super tight so thought it was maybe a bearing problem or something. I'll report back if the problem continues. Bikes: 2016 Giant Fastroad CoMax 2, 2002 Jamis Tangier, Classic Nakamichi 10 speed. I had the same thing happen with my Fuji Sportif 1.3, it was new with only 20 miles on it. Your video is very similar to mine... with the click happening at the 12 o'clock position for the right side. Tried reproducing the sound off the bike and couldn't, only when on the bike. Not really sure how that all changed. One morning it just all stopped. I had the same noise start suddenly on my Specialized Crosstrail Expert with around 1000 miles on it. I found out that most Bike Manufacturers use low end pedals on their bikes. I just replaced the pedals with a better pair of "Metal Alloy" pedals and noise b gone!! I could have sworn the noise was from a bad link in the chain......but LBS knew immediately what it was. Hmm interesting. I have new pedals on mine after replacing the stock ones a couple of months ago. Hope they're not worn out already. I'm going for either of two problems. 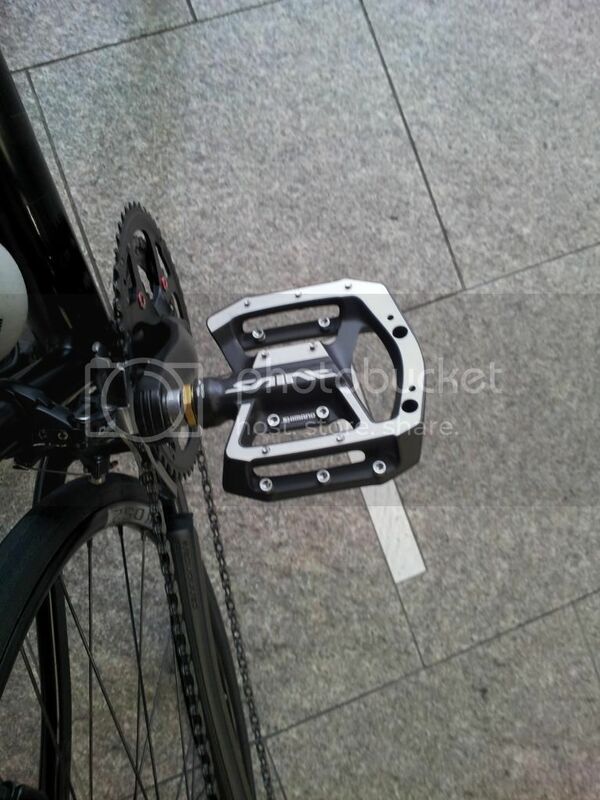 Most likely the pedals, but could also be that after the 1000 kms, your front derailleur cable has stretched, and the high / low screws weren't set right. Your chain under load could be rubbing at the point of your pins on your front chain ring. I'd suggest saint pedals. A little expensive, but the quality is high. Do the pedals have plastic bodies? In my experience those are junk. My method for such a noise is to swap the pedals with one of my other bikes. If the noise goes away, I know it is the pedals. If not, I know I need to replace the bottom bracket. I can't understand why a bike shop can't find a noise, and would swap a bike because of it. Unless they have identified the fault as irreparable, I'm shocked. Just another thing to check is the ring lock on the cassette. I have identified noises from a slightly loose cassette on three bicycles, which owners and bike shops swore was coming from the BB or cranks. Its difficult to diagnose sounds in real life, much less a video but Im going to guess its the bottom bracket. Bike brands tend to cheap out on BBs, pedals, hubs, headsets, grips, and seats. Try to get a hollow spindle Shimano cartrdige BB for lower weight and long life. Those cheap OEMs start life gritty and just get worse. It also seems that your front derailleur is not well adjusted - is that the chain I keep hearing rubbing along the cage? If so, it could even be the outer cage hitting the crank arm with every pedal stroke. For this and the OP's issue,try putting a couple drops of lube into the spindles of your rear derailleur's jockey wheels. I've had a similar issue in the past and this fixed it. It will only take a second to do,and if nothing else it will eliminate it as a cause,plus it wouldn't hurt to give the jockeys a touch of lube anyway. Thanks! Sorry for the current lack of knowledge, but what type or brand of lubricant do you recommend? Chain lube works fine,but you could also use Triflow or similar if you have it. I did just this and so far looks like it's fixed my issue. I had tightened them up before and the problem remained, but taking them completely off and adding some lube seemed to have done the trick. Cheers! I'd suggest ensuring you have good loctite (or similar) on the bolts when you put the jockey wheels back on. There have been incidents when people have not and accidents have happened.